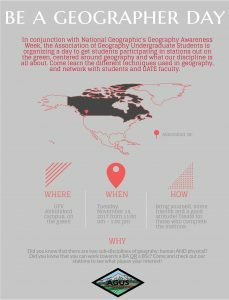 Have you ever wondered what a geographer does? Do we read maps all day? Do we just recite the capital cities of countries around the world? Geography is much, much more. Join us for ‘Be a Geographer’ Day on the Abby Green to explore skills and techniques used by geographers. We will have demonstrations and activities related to rock & mineral identification, water quality analysis, measuring the weather, soil analysis, plant ID, city design, a GPS treasure hunt and geography trivia. Fun and games for all!